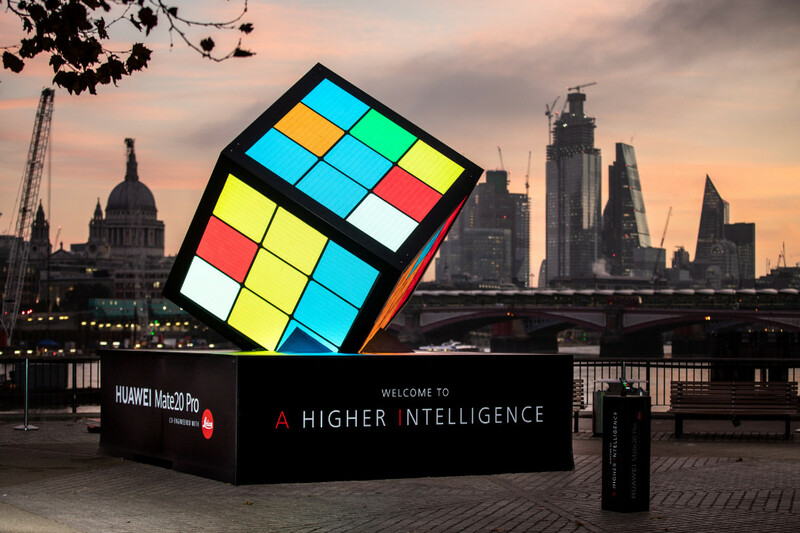 25th OCTOBER 2018, LONDON, UK: A giant Rubik’s Cube solvable by the Artificial Intelligence inside a smartphone was unveiled by Huawei on London’s South Bank to celebrate the launch of the new Mate 20 Pro – the most hotly anticipated smartphone of the year. Huawei, the world’s second largest smartphone manufacturer, developed the 4.6m high cube and its accompanying app by utilising the dual Artificial Intelligence capability embedded in the smartphone’s brand new, innovative chipset. Georgia Toffolo joined Huawei to mark the launch and played the cube using the AI inside Huawei Mate 20 Pro to solve the classic puzzle. It’s a game that has captured the imagination of the nation, and has firmly held a place in popular culture for decades. Some of the world’s top academics, from mathematicians to think tanks and universities like MIT have studied the combination puzzle to determine the optimum way to solve it, but this is the first time a smartphone has used dual-AI power to assist in finding the best route to its satisfying conclusion. Huawei’s app uses AI to optimise the number of moves required to solve the cube and outsmart the puzzle’s 43 quintillion different combinations. After the cube is initially shuffled, each subsequent move is passed through the AI model and algorithms to give the user hints, via the app, about what the best next move is. Justin Costello, Huawei Director of Marketing, UK and Ireland, said: “The Huawei Mate 20 Pro is our most intelligent handset to date. It’s the world’s first Dual-NPU powered smartphone, meaning that we’re able to give people a more intelligent performance with less power consumption. The Huawei Mate 20 Pro’s Dual-NPU and sophisticated process technology makes it faster, more intelligent and more efficient than any other Android Smartphone on the market, setting a new bar by which all 2018 smartphones will now be measured.